The last of the Christmas knitting. Finally. A quick (approximately 4 hours) cowl in squishy alpaca blend, using only half a skein so I can make another one. The Guy Next Door cowl by Devin Fredrickson, Berroco Ultra Alpaca (50% alpaca/50% wool), 110 yds on US 6/4.0 mm needles. Started 17 December during "The Illusionist", finished 18th December during "The Golden Compass". Max of four hours to finish, but probably more like 3 if I hadn't messed up and dropped a stitch. 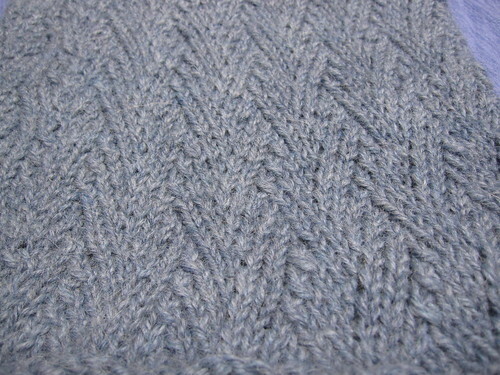 The pattern calls for five repeats of the stitch pattern (12 rows), but I did an extra half-repeat for good measure. My only beef with the pattern was the fact that the stitch pattern was set up so that it didn't repeat evenly - the last repeat of the pattern in the round was shifted a bit to avoid doing something funky over the start of the round. I think, with some judicious shifting of the start point, I can make it so there don't need to be any hijinks, which would be fabulous because I love this stitch pattern, and I think it should be a hat and maybe a men's sweater. Just lovely movement. This was my first time using this particular yarn, and I really like the feel. 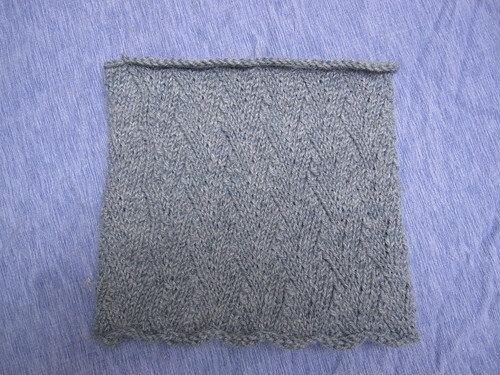 It was quite crisp while knitting, maybe even a bit rough, but after a bath it bloomed nicely and is really soft. 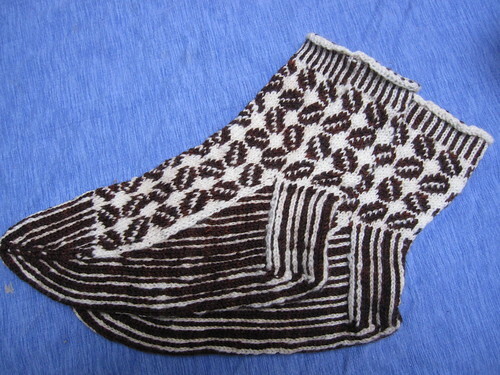 My other final project was re-knitting my too-large Cool Beans sock. Now the pair matches (more or less). Written by porpoise On December 20, 2010 In "Christmas 2010", "FO", "cowl"